In a recent interview, Robert Pattinson tells that a fan asked him to bite her baby. 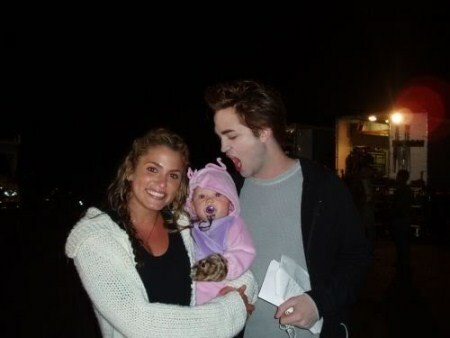 It happened during the filming of the first Twilight movie. “My favorite moment from the whole thing was when we doing the first one and there were people waiting by the perimeter fence and this woman handed over her three-month-old baby to the AD [assistant director] to meet us,” he said. “The AD didn’t know what to do with it, so he was like, ‘I think she wants you to sign the baby or something?’ and then we realized she wanted pictures with the baby. Pattinson insists he didn’t make physical contact with the infant and only pretended to bite when posing for the picture. “I didn’t actually, like, touch it. It’s a funny picture. The baby was so small its entire head fit in my mouth,” he added. Jennifer Garner Keeping Her Growing Bump on the Down-Low?